Wireline Electric Logs tell an important geological story…to file or not to file that is the Q! Update….Joe Stasulli at the RRC said in an email dated 10/29/2015 that…“Many operators opted not to spend money on lof logging of these wells. The commission allowed them to so PER SWR 16.” HOWEVER this link says they do .. ..but then see the item d) I boldfaced and be prepared to be con-fracking-fused. (1) “Well” means a well drilled for any purpose related to exploration for or production or storage of oil or gas or both oil and gas, including a well drilled for injection of fluids to enhance hydrocarbon recovery, disposal of produced fluids, disposal of waste from exploration or production activity, or brine mining. (2) “Electric log” means a wireline survey, except dipmeter surveys and seismic wireline surveys, run in an open hole or a cased hole of a well for purposes of obtaining geological information. (3) “Drilling operation” means a continuous effort to drill or deepen a well bore for which the commission has issued a permit. (4) “Operator” means a person who assumes responsibility for the regulatory compliance of a well as shown by a form the person files with the commission and the commission approves. (b) In this subchapter, “operator” includes a predecessor or successor operator. Added by Acts 1985, 69th Leg., ch. 978, Sec. 1, eff. Sept. 1, 1985. Acts 2005, 79th Leg., Ch. 1001 (H.B. 484), Sec. 1, eff. September 1, 2005. Acts 2005, 79th Leg., Ch. 1001 (H.B. 484), Sec. 2, eff. September 1, 2005. Sec. 91.552. ELECTRIC LOGS REQUIRED TO BE FILED; CRITERIA. (a) Except as otherwise provided by this subchapter, not later than the 90th day after the date a drilling operation is completed, the operator shall file with the commission a copy of each electric log, including each borehole section of the log at all depths, run after September 1, 2013, in conjunction with the drilling or deepening of the well that meets basic criteria established by the commission. Each electric log must be filed with the commission electronically in a manner acceptable to the commission if the commission has the technological capability to receive the electronic filing. (b) The commission by rule shall establish criteria for electric logs to be filed with the commission. (2) an electric log was not run. (d) Nothing in this subchapter requires an operator to run an electric log in conjunction with the drilling or deepening of a well. Acts 2005, 79th Leg., Ch. 1001 (H.B. 484), Sec. 3, eff. September 1, 2005. Acts 2013, 83rd Leg., R.S., Ch. 279 (H.B. 878), Sec. 1, eff. September 1, 2013. Sec. 91.553. AVAILABILITY OF ELECTRIC LOGS. (a) Except as specifically provided by this section, each electric log filed with the commission under this subchapter is not confidential and is public information under Chapter 552, Government Code. (2) five years after the date that the drilling operation was completed, if the well is a bay or offshore well. (c) Repealed by Acts 2013, 83rd Leg., R.S., Ch. 279, Sec. 6, eff. September 1, 2013. (d) Repealed by Acts 2013, 83rd Leg., R.S., Ch. 279, Sec. 6, eff. September 1, 2013. (e) An operator required to file an electric log under this section who has held the log during a period of confidentiality shall file the log with the commission within 30 days after the conclusion of the period of confidentiality. 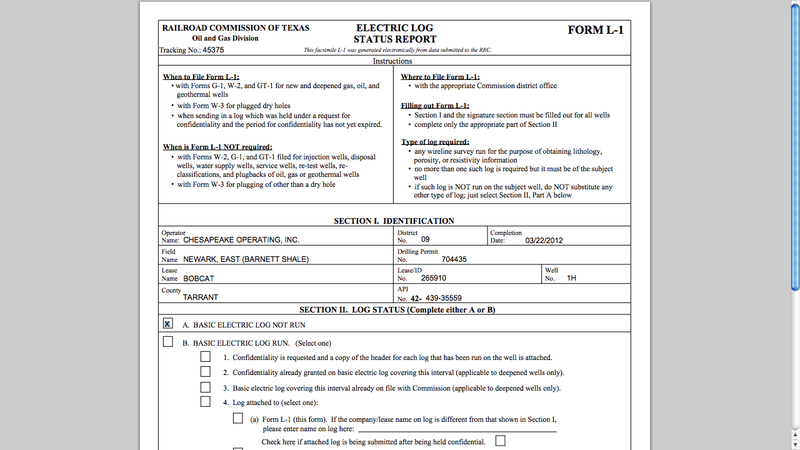 (f) An operator who fails to timely file with the commission a written request under Subsection (b) that an electric log remain confidential and not be made available as public information shall file the log with the commission immediately after the conclusion of the period for filing the request. Added by Acts 1985, 69th Leg., ch. 978, Sec. 1, eff. Sept. 1, 1985. Amended by Acts 1995, 74th Leg., ch. 76, Sec. 5.95(90), eff. Sept. 1, 1995. Acts 2005, 79th Leg., Ch. 1001 (H.B. 484), Sec. 4, eff. September 1, 2005. Acts 2013, 83rd Leg., R.S., Ch. 279 (H.B. 878), Sec. 2, eff. September 1, 2013. Acts 2013, 83rd Leg., R.S., Ch. 279 (H.B. 878), Sec. 6, eff. September 1, 2013. (2) members of the commission and its employees in the exercise of their powers and duties under this code. Acts 2005, 79th Leg., Ch. 1001 (H.B. 484), Sec. 5, eff. September 1, 2005. Sec. 91.555. MANAGEMENT AND STORAGE OF ELECTRIC LOGS. The commission may contract with any person for the management and storage of the electric logs filed with the commission. (2) impose an administrative penalty on the operator in the manner provided by Sections 81.0531-81.0534 for each well for which the operator failed to file an electric log. Acts 2013, 83rd Leg., R.S., Ch. 279 (H.B. 878), Sec. 3, eff. September 1, 2013. Chesapeake didn’t do electronic logs at MANY of the Arlington TX drill sites (I did see where they did them at the GM plant-but not nearby at the Truman site near the ATT Stadium)…just look at the completions records online at the RRC. Get the API number off the city’s website and then go to the RRC site. Not that I approve of any highly radioactive gamma ray beamed into the formation in my hood. Since WFAA was featuring a specialist who was looking at these logs of some wells associated with a family who’s water well blew up and burnt them and so I thought I’d blog about this. For Arlington residents, even though we have over 300 private water wells, I believe the risk extends not to those blowing up on us, but to the mere migration of gasses that might seep up into our soil if those casings aren’t deep enough and done right like in the case alleged for that family whose water well blew up ….and they got burnt. Here are a couple snaps of the RRC electric logs….. This entry was posted in Uncategorized and tagged chesapeake, electric, electronic logs, wireline long. Bookmark the permalink.